Wood utility poles have served for more than a century as the backbone to the North American electrical distribution system. While new technologies for overhead systems have emerged, the proven performance of wood utility poles has secured their position as the preferred choice for utilities. The POWERLINE 2019 conference will review new developments and recognized best practices for wood pole overhead systems. The two-day conference feature insights on wood pole quality and design, service life, maintenance and remediation, system resiliency, disposal and high voltage assemblies. 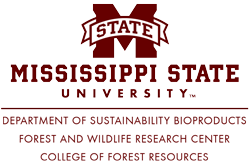 The conference will be held June 4-5 on the campus of Mississippi State University in Starkville, Miss. It is sponsored by the North American Wood Pole Council and the Mississippi State Department of Sustainable Bioproducts. The program will include classroom presentations and a field visit to the Mississippi State High Voltage Laboratory, the largest university operated high voltage lab in North America. Laboratory demonstrations will include what happens when tree limbs come in contact with lines. Continental breakfast and lunch will be provided each day and there will be a reception for attendees on Tuesday, June 4. Each registered attendee will receive a certificate of completion for 12 hours of instruction, which can be used to qualify for Continuing Education Unit (CEU) credits. Jason Rollins, H.M. Rollins Company, Inc.
Russ Wikenloh, Electric Utility Ind. Sustainable Supply Chain Assn. Copper Naphthenate - Jeff Lloyd, Nisus Corp.
Creosote - Heath Huschak, Koppers, Inc. Cost is $195 per attendee. Each attendee will receive digital versions of the presentations and NAWPC technical guides. You can register online by clicking on the Register Now button at the top and bottom of the page. To pay by check or to register multiple attendees from the same company, download a registration form. Deadline for registration is Wednesday, May 29. No cancellations will be accepted after that date. For any questions or additional information about the Powerline 2019 conference, contact the North American Wood Pole Council at info@woodpoles.org.